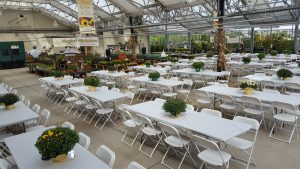 This year we will host our annual Ladies' Night Out event on Thursday, September 21, 2017, at Wilson’s Garden Center in Newark, Ohio. The event will feature local vendors, bakers, and creators selling items from clothing, baked goods, to handmade toys! Wilson's Garden Center is kind enough to offer 10% off any purchase in their store during the event and they set up a wonderful display of flowers at every table that will be auctioned in support of Hospice of Central Ohio. Hospice of Central Ohio would like to thank everyone who has attended this event in the years past and we hope to see you again this year! Don't worry! We do this every year. CLICK HERE to join our mailing list and get notified when registration opens up!